Skagway day is another great day for shore excursions, because walking through town wouldn't take very long. We had a tour planned for the afternoon so that we could have lunch on the ship beforehand. Time in port was from 6:30 am to 5:00 pm. We had the option to be let off the tour bus in town, which was approximately a 10 to 15 minute walk to the ship depending on where it's docked. I'm finally looking at the pictures on my Mac, not my iPhone. Usually I know all the ends and outs of my iStuff, but I was pleasantly surprised that photos on the desktop are grouped like they are on the phone. The photos show you where you were and you can look at them on a map or satellite and you can even look at the satellite image in 3D. The arrow is pointing at a mosquito on our tour bus window; proof that there are mosquitos in Alaska. *Look at the faded pink line. That is the border into Canada. 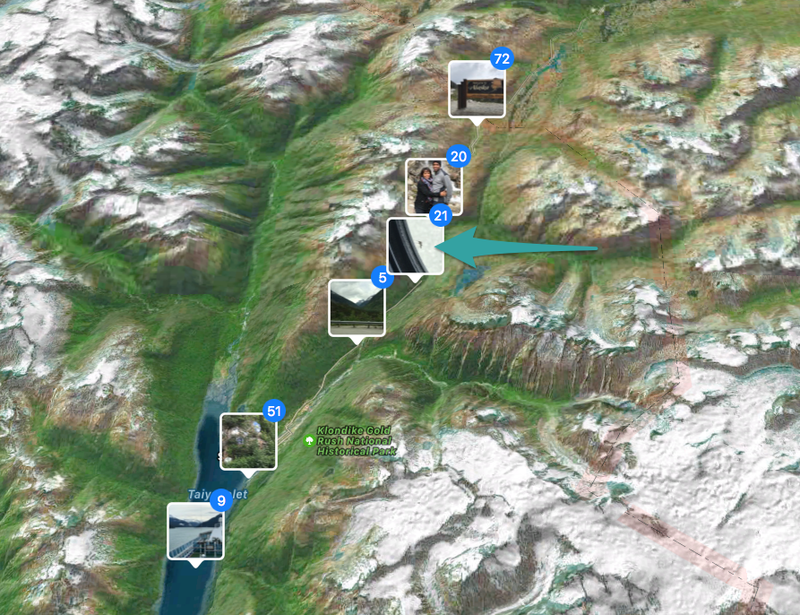 So, we where in Klondike Gold Rush National Historical Park and I didn't even know it. The tour bus guy probably said so, but he was telling a story that I just couldn't get into. I remember him saying, "Gold nuggets the size of Lima Beans..." and that's about it. We were on the Klondike Summit tour. It was a 30-minute ride out and back, crossing over into Canada, with three stops to get off the bus and take pictures. There were approximately sixteen people on our tour, and the tour bus guy took pictures of everyone in front of this sign. Photo credit to our friend. I think he actually took this one at the same time as the tour bus guy. It was chilly and overcast when we got off the bus on our tour. I think our elevation was about 3200 feet? Truthfully I needed a hat but I wanted to wear what I wanted to wear. Once we were back in town, I was able to shed my jacket and scarf and asked Papa Bear to please take a photo without his beanie on. The town of Skagway was quaint. I never think of questions until it's way too late to ask. But we did find out from a jewelry story lady that they close the store and move somewhere else for six months. So I wonder if at the end of October, when the Alaskan cruises are no longer coming through, is this place a ghost town? Looks like it would be. By this point in the cruise, you have not had a good cup of coffee, not even the paid for coffee. 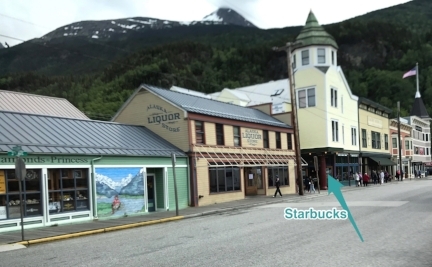 Well good news, Skagway had a Starbucks! I was so wrapped up in my Americano that I didn't take a picture of anything else. 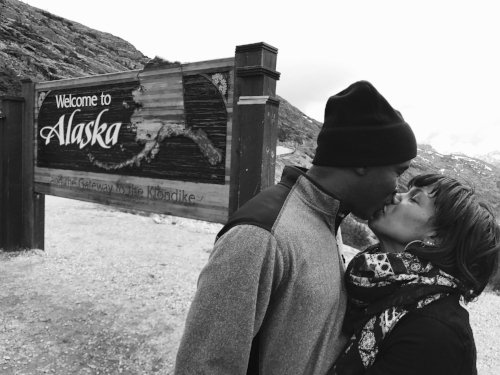 We went into a few souvenir shops and with it being our last stop in Alaska, we bought a few more things. Back on the ship, we had dinner reservations at the Crab Shack. I can't remember now if there was a menu or if everybody just gets the same thing. So the appetizer was gross. I like salmon but it was some kind of salmon spread. Anyway, it was yuck. But the main meal was wonderful. All I remember about dessert is that we were too full to enjoy it. Best acting award goes to the ladies. The guys faces truly depict how we felt. 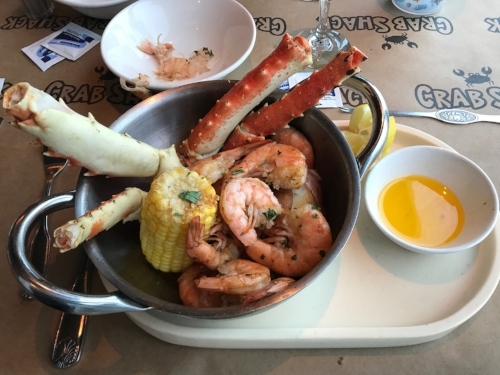 Plan for one night at The Crab Shack and skip the salmon spread. Linked up with the Finish the Sentence Friday prompt via finding Ninee where the prompt this week is, "What moves me..."